Among rechargeable batteries, the Energizer Recharge Universal hits the sweet spot between performance and value. If a single-use disposable is right for your needs, skip the big name brands and go for bargain batteries from Amazon and IKEA. They last just as long, work just as well, and cost lots less. Reviewers say the AmazonBasics Performance alkaline battery delivers performance on a par with the leading brands at a much lower price. Although it isn't covered in most professional tests, the one that includes it finds it lasts roughly as long as more recognized brands in both high-drain and low-drain devices. These batteries also get high marks from users at Amazon.com, who largely agree that they perform just like the top brands. Energizer's Ultimate Lithium earns praise from both professionals and users for its performance and long shelf life. Professional comparison tests prove that these batteries are much longer-lived than other disposable batteries, particularly in high-drain devices such as cameras. They're also lightweight and can function at extremely high or low temperatures. They last up to 20 years in storage, and users say they don't leak the way alkaline batteries can. The Energizer Recharge Universal offers the best balance of power and long service life in a rechargeable battery. With 1,500 mAh of power (in the AA size), it stands up well to competitors in head-to-head testing. It also holds up through repeated recharge cycles, delivering up to five years of service with normal use, and retains its charge for up to a year in storage. Finally, unlike some other rechargeable batteries, it's easy to find in stores. 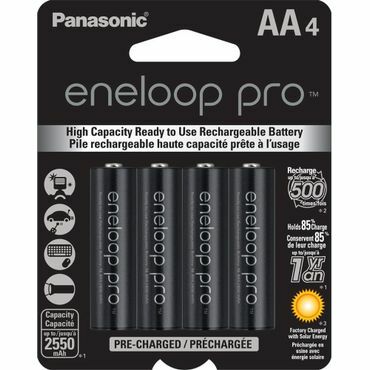 If you're looking for AA or AAA rechargeable batteries that can power your highest-drain devices, you can't do better than the Panasonic Eneloop Pro. These batteries have an above-average capacity of 2,550 mAh, so they can go longer between charges in power-hungry devices. However, they have a higher price and shorter service life than the Best-Reviewed Energizer Recharge Universal, so they're not as good a long-term value for ordinary use. Disposable batteries come in two main types: alkaline and lithium. Alkaline batteries are less expensive and are best suited for low-drain applications, while pricier lithium batteries are better for high-drain devices such as a camera flash. Depending on type, disposable batteries can retain their initial charge from 10 to up to 20 years on the shelf -- far longer than even the best rechargeable. If you need a size other than AA or AAA, there are more options available among disposable batteries than rechargeable ones. Rechargeable batteries are more expensive initially than disposable batteries, costing anywhere from $10 to $40 for a pack of eight AA's. Although older technologies such as nickel-cadmium (NiCd) batteries still exist, experts say that the most effective type are nickel-metal-hydride (NiMH), and all of the rechargeable batteries in this report use that technology. Many NiMH batteries are low self-discharge (LSD), which means that they can retain their charge longer in storage than earlier products, though still nowhere near as long as most disposable batteries. Making the choice: rechargeable or disposable batteries? Both types of batteries have their pluses and minuses. Despite their higher initial cost, for most uses, rechargeable batteries are a good long-term value. That's because batteries of this type can be recharged and used again and again – hundreds of times, according to experts. If you pay $20 for a set of four AA batteries and a charger, and you use the batteries 500 times before they wear out, their cost per use (including the electricity used for charging) comes to around 5 cents. By contrast, four-packs of disposable alkaline batteries could cost you between $3 and $4 a pop -- though some cheaper, high-quality options are available as well -- see our discussion on the best disposable batteries (below) for more information. In addition to being more cost-effective, rechargeable batteries are a greener choice. Choosing one rechargeable battery instead of 500 alkaline ones reduces the amount of waste by a factor of 500. It's also easy to recycle rechargeable batteries at the end of their life by dropping them off at a big box hardware store such as Home Depot or Lowes, office supply stores such as Staples, and similar locations. Disposable alkaline batteries, by contrast, can't be recycled in most areas so they end up in landfills, etc. Lithium single-use batteries typically must be recycled, but finding local drop-off points can be a challenge. In the past, rechargeable batteries had a few major drawbacks compared to disposables. First, they tended to lose their charge over time, so batteries kept in storage often had to be recharged before use. This made them less suitable for emergencies. However, modern low self-discharge (LSD) rechargeable batteries, such as the Panasonic Eneloop, have largely eliminated this problem. These batteries retain around 75 percent of their charge after one to three years in storage. Second, until recently, it was hard to find rechargeables in sizes other than AA and AAA. Many popular brands, such as the Eneloop and the more powerful Eneloop Pro, still come in only these sizes. However, there are now a couple of well-known brands, including the Energizer Recharge and the Powerex Precharged, that come in all standard sizes: AAA, AA, C, D, and 9-volt. The Powerex batteries aren't widely available in stores, but they're fairly easy to find online, and the Energizer batteries are sold at several major retail chains. You can find more information about all these rechargeable battery brands in our discussion of the best rechargeable batteries. Turning to disposable batteries, the cheapest and the most widely available type is the old-fashioned alkaline battery. Made by familiar brands like Duracell, Energizer, and Rayovac, these typically cost around $6 for a pack of eight AA batteries, the most common size. However, alkaline batteries do best in devices with relatively low current draws; think remote control or alarm clock rather than digital camera. Lithium batteries, like alkaline batteries, are disposable. However, they hold more energy than alkaline batteries and can withstand higher current draws. In one expert test, a typical lithium battery lasted about 50 percent longer than a typical alkaline battery at a low current drain of 200 milliamps (mA), which is about the amount used by a child's toy or a flashlight. At a higher current draw of 1,000 mA, comparable to a digital camera, the difference was even more dramatic: The lithium batteries lasted nearly three times as long as the average alkaline. Lithium batteries are also lighter in weight than alkaline batteries, and they function better at extremely low temperatures -- both useful qualities for winter camping and hiking. In addition, they have a longer shelf life. While alkaline batteries last 5 to 10 years, in storage, lithium batteries can last 10 to 20 years, making them useful for emergencies. That's because they don't "self-discharge," or consume their own power, as fast as an alkaline battery. The downside to lithium batteries is their higher cost: around $12 for a pack of eight AA's. This means that for low-drain devices, the old-fashioned alkaline actually gives you a lot more bang for your buck. A lithium battery will last about 50 percent longer, but it'll cost twice as much. The exception is devices with very low power use, such as smoke detectors. In these, the lithium batteries have an advantage because of their lower self-discharge rate. Many users say they've been able to keep smoke alarms going for ten years or more on a single lithium battery. And for high-drain devices, lithium batteries not only provide a better value but also save you the trouble of toting around extra batteries wherever you go. "The Best Rechargeable AA and AAA Batteries"
To find the best batteries, we considered two main factors: performance and longevity. Performance includes battery capacity and how long batteries last in storage. Longevity, for alkaline and lithium batteries, is simply a question of how much power they can deliver before running down. For rechargeable batteries, longevity also includes service life, or the number of times they can be recharged. Information about both performance and longevity can be found in professional battery tests conducted by consumer magazines and online publications. User reviews from sites such as Amazon.com helped us find information about specific problems with batteries, such as which brands are most likely to leak. While rechargeable batteries offer the best value for most everyday jobs, old-fashioned alkaline batteries still come in handy for emergency use. But is there really any difference among competing brands? We found conflicting information on this point. Energy expert Michael Bluejay at Michael Bluejay's Battery Guide insists that "capacity is pretty similar from one alkaline maker to the next" and cites several tests to back up his claim, but most of them are several years old. More recently, a test of batteries at Worcester Polytechnic Institute, reported at DealNews.com, found that name-brand alkaline batteries performed almost identically to generic brands and concluded that it makes most sense to buy based on price alone. However, other tests of alkaline batteries contradict these findings somewhat. Both the Battery Showdown conducted by Bitbox, a British electronics maker, and the latest battery tests at ConsumerReports.org and Choice, its Australian counterpart, found slight but significant differences in performance between brands. Moreover, users on Amazon.com and other sites we consulted are much happier with some battery brands than with others. 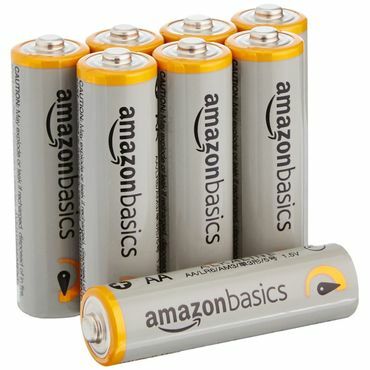 No alkaline battery earns more recommendations at Amazon.com than the AmazonBasics Performance (Est. $12 for 48 AA batteries). Over 14,100 users have reviewed these batteries, and most say they last as long as big-name brands but at a lower cost. A few reviewers have conducted their own at-home comparison test and found that the AmazonBasics Performance holds its own against name brands like Duracell, Energizer, Rayovac, and Eveready. There are some complaints about batteries that leaked or were dead fresh out of the package, but fewer than we saw for some top brands. AmazonBasics Performance batteries are included in only one professional test, at ConsumerReports.org. Their performance there is respectable but not outstanding, with above-average results in both a low-drain flashlight and a high-drain toy. However, its satisfactory performance and low price tag put together are enough to earn it a recommendation from the editors. Surprisingly, the two leading battery brands, Duracell and Energizer, don't fare much better than the AmazonBasics in tests. The Duracell Coppertop (Est. $15 for 24 AA batteries) is among the top performers in one professional test, holding out longer than most other alkaline batteries in both a flashlight and a child's toy. However, a different test places these batteries in the middle of the pack. They do very well under low-drain conditions, but their performance under high drain is unimpressive. This, combined with their relatively high price, leads the testers to declare them a poor value. User reviews of Coppertop batteries are also somewhat mixed. At Amazon.com, where we found more than 3,000 reviews for these batteries scattered among various sellers and various quantities, most users praise their endurance and long shelf life. However, this brand also seems to get more complaints than some other brands over leakage. The Energizer MAX (Est. $5 for 8 AA batteries), by contrast, gets excellent reviews from owners for its leak-free performance. Energizer even offers a "no leak guarantee," promising to repair or replace any device damaged by leakage from an Energizer MAX battery. However, their performance in professional tests is unimpressive. One test finds them slightly better than Duracells for high-drain use, but in most tests, their performance is identical or slightly worse. There are a couple of store-brand batteries that do surprisingly well in professional tests. For instance, ConsumerReports.org gives very high marks to the Kirkland Signature Alkaline (Est. $40 for 144 AA batteries), a store-brand battery from Costco. It performs nearly as well as the Duracell Coppertop and well ahead of the Energizer MAX, at a significantly lower price. However, user reviews for this battery at Amazon.com (where it is sold by third-party resellers) and Costco.com, while not terribly abundant, are consistently terrible, with the majority of owners of complaining about leakage and ruined equipment. So despite their low price and good test results, we'd have to say these batteries are no bargain. The other surprisingly strong performer in comparison tests is the IKEA ALKALISK (Est. $6 for 10 AA batteries). In the extensive Bitbox comparison test, the IKEA battery is "the clear winner" for both high-drain and low-drain use, delivering more power than its competitors at a very low price. There isn't a lot of user feedback available for these batteries, but the handful of reviews we found at IKEA.com and Amazon.com are mostly positive. Owners generally say these batteries are a great value, lasting as long as the major brands at a much lower cost. Until recently, ALKALISK batteries were only available in IKEA stores. Since there are fewer than 50 such stores in the country, this bargain-priced battery wasn't an option for many buyers. It's now possible to buy these batteries from resellers on Amazon.com. However, in a Facebook post, IKEA points out that they do not sell products on Amazon.com or other third-party sites at this time, and do not have any relationship with resellers that list products on those sites. In addition, if you buy through an Amazon.com reseller, the batteries cost about three times as much as they would if bought directly from IKEA, giving them little advantage in price over the AmazonBasics batteries. However, if you happen to have an IKEA in your area, you can pick up some good batteries at a great price (Est. $2 for 10 AA batteries). There may be some question about whether any alkaline battery is better than any other, but there's no question at all about the difference in performance between alkaline batteries and lithium batteries. In professional tests, lithium batteries consistently outperform alkalines by a wide margin, especially in high-drain devices. In addition, lithium batteries lose charge at a much lower rate than alkaline batteries. This means they last longer in storage and in devices that draw very little current, such as smoke detectors. In the United States, Energizer is the leading manufacturer of lithium batteries and the only brand that's covered in professional tests. 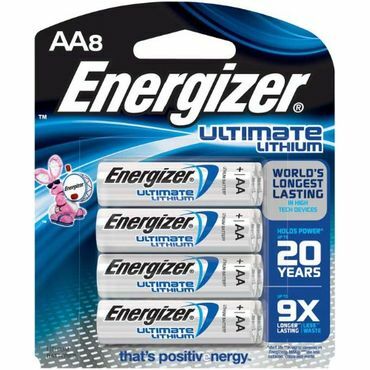 Energizer boasts that its Energizer Ultimate Lithium (Est. $13 for 8 AA batteries) is the "longest lasting battery in high-tech devices." It also claims that the Ultimate Lithium weighs roughly 1/3 less than an alkaline battery, can perform at temperatures between -40°F and 140°F, holds its charge for up to 20 years in storage, and never leaks. The battery comes in AAA and AA cell sizes, as well as the 9-volt size required for many smoke detectors. 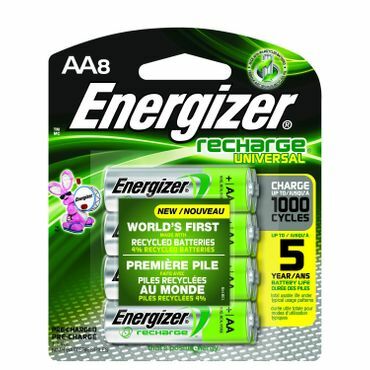 The Energizer Ultimate Lithium consistently trounces the competition in tests of disposable batteries. It lasts longer than any alkaline battery in both high-drain and low-drain devices, though its advantage is greatest with high-drain ones. The Ultimate Lithium has excellent reviews from users at Amazon.com, as well. In nearly 2,500 reviews, owners give it 4.5 stars out of 5 overall, saying it's long-lasting, lightweight, and ideal for use in cameras. They also like its long shelf life and ability to perform at low temperatures. The only disadvantage of the Ultimate Lithium is its high cost. At just over $1.50 per battery, it's more than twice the price of the AmazonBasics Performance, our best-rated alkaline battery. Thus, it's probably best to save these lithium batteries for devices that really need their superior performance. For your basic flashlight or remote control, you'll get better value from a simple alkaline – or one of the rechargeable batteries, covered in their own section of this report. For rechargeables, short charging time.